Hire Inspirational, Educational and Motivational Speaker, Jules Alvarado, for an energetic and moving Trauma Informed Care and Healing Keynote or Conference workshop. Beginning with our Trauma-informed Care Organizational Self-Assessment, this five day, intensive, experiential and on-site training is designed to prepare participants to not only practice Emotional Regulatory Healing but to provide a sustainable foundation for future outcomes through ongoing training. Our staff supports your increasing awareness and readiness to adopt the key components of a trauma-informed care organization including secondary trauma relief practices. We help you to identify 1)what you need to keep doing, 2) what you need to stop doing, or 3) what you need to start doing; and we provide the tools and strategies to implement immediately. This is a yearlong consulting package designed to help you complete the assessment, review results, and develop strategies for implementation. Post-training we meet monthly for a two-hour teleconference as we review cases, treatment planning needs, policies, and procedures. Included are materials needed to provide ongoing training in Trauma-Informed Care through Emotional Regulatory Healing. 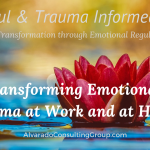 This on-site, hands-on, experiential training provides the framework, skills and supervised practice of Emotional Regulatory Healing© as your organization’s trauma-informed paradigm. This training is specifically designed for those who choose to practice Emotional Regulatory Healing within the organization committed to sustainable outcomes. Brain-Based interventions are practiced. A full day training, on-site, for all your staff provides an overview of trauma, its impact on social, emotional and behavioral presentations, explains what it takes to be trauma-informed, and provides strategies for responding to trauma in the therapy office, hospital unit, classroom or home. Brain-Based strategies are introduced. How does trauma affect a survivor as they journey through life? We have only recently been able to understand the holistic impact of complex trauma on a survivor. Experts are beginning to openly discuss the impact of trauma on the brain, body and spirit. As a survivor of trauma who has embraced holistic recovery, my awareness has led me to a deep understanding of the impact of trauma. I discuss my experiences with trauma by highlighting the physical, sexual, mental, emotional, relational, spiritual and parental impacts. I also describe my recovery paradigm, Emotional Regulatory Healing, which is a parallel process of recovery for both client and provider simultaneously. Whether we have suffered and survived complex trauma or not, we are all in need of healing. What is trauma anyway? How does trauma impact learning? Why doesn’t Behavior Modification Work, AND, What Does? This training helps educators understand the causes of trauma and how it manifests in the school setting. 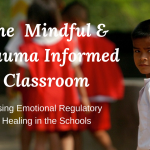 Learning about, and then learning to apply the paradigm of Emotional Regulatory Healing provides a framework that fills a need in the practical sense with strategies for calming disruptive behaviors in the classroom. Brain-based interventions are made simple within a deeper understanding of the neurological impact of trauma The Mindful and Trauma-Informed School training explores 3 Attributes of a Trauma Sensitive School; invites participants to complete a Trauma-Informed Assessment of their current school; Create a 3 step strategy to introduce Trauma Informed Education and to Take away concrete steps with resources to support implementation. Parenting is challenging for most of us. But for those who are parenting children of trauma, it is even more so. And, it is extremely difficult for parents, foster and adoptive parents who are also survivors of trauma within the family because we are left with no intuitive guidelines for successful parenting. Through activities which promote an honest and vulnerable understanding of our parenting, we will work together to evaluate the current belief systems driving your parenting, the defense mechanisms you use to cope with your triggers and the impacts your children may be feeling. We will also create a series of self-care actions to help you strengthen the boundaries within your family. Once you have identified some new boundaries, we will create another series of actions for building a stronger relationship with your children. Through these steps, we will work through the traumatic triggers that are keeping you from a life of more peaceful parenting. Need a specific topic covered in your keynote? Connect with us to explore the possibilities that Jules can offer your group! 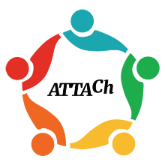 Many conferences, symposiums, seminars, and trainings focus on Trauma Informed Care and Healing. Juli Alvarado’s Key Notes address the root-level dynamics that affect personal and professional well-being: Why aren’t I motivated sufficiently to make necessary personal changes? How can I find this motivation? 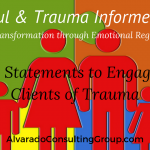 How does my own life trauma affect my capacity to receive, honor, and serve the trauma of my clients? How does my inner-matrix relate to my capacity to serve others? How does self-care relate to my role within my organization? How can I, and my organization, become more compassionate, supportive, and effective in serving others? Using a unified approach for addressing developmental trauma, Jules work includes the latest neuroscientific and psychosomatic findings, integrated with mindfulness and ancient wisdom. Jules explores the spiritual dimension of trauma and attachment. The courageous struggle with traumatic experience, life-denying effects of trauma and its presence in our body/brain/spirit, along with the gifts that lie within the healing process will be covered. We will look at the force of energies that trauma brings, and how to harness the energies for healing at every level. 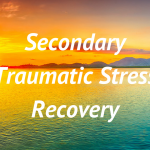 Move your group from Chaos to Calm; Learn about an alternative view to traditional diagnosis and treatment of wounded populations as you gather invaluable insight about new formations to the direction of healing of trauma . ‘Information gathering’ is a process that all traumatized people utilize as they attempt to make sense of a dangerous would. This is a process in which wounded people learn to use what is most readily available to them – their behavior – to test, push and challenge unfamiliar people and environments that have entered their lives. In this Key Note we will explore new directions in responding to our traumatized clients that bring increased emotional regulation and decreased problematic behaviors through targeted brain based, simple and highly effective interventions. Combining her personal experience as a foster and adoptive mom, and a trauma therapist, this key note is perfect for parent groups and family members of traumatized people. Jules provides an overview of trauma, its impact on social, emotional and behavioral presentations, explains what it takes to be trauma-informed, and provides 3 specific strategies for responding to trauma in the therapy office, hospital unit, classroom or home. 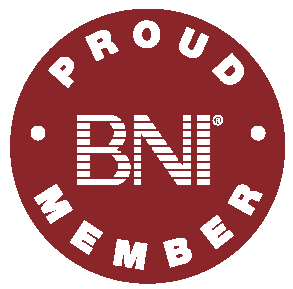 Start today with one of our most effective programs listed above. Effective strategies for severe behaviors. Are you looking for someone to speak to your group about healing from Trauma and Trauma Informed Care? Making the transformation to a Trauma Informed Care environment requires a change of process, people and systems throughout your group. As a survivor, Juli Alvarado speaks from experience about the childhood recovery process. As a licensed therapist, trained in integrative trauma healing, and with a strong background in program management, Juli explores with you how a survivor’s journey is enhanced by organizational programs, procedures and legislative advocacy. 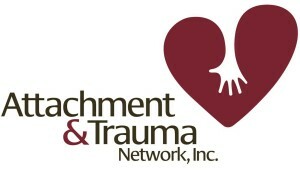 Helping organizations and individuals develop and provide Emotional Regulatory Healing as a Trauma Informed response is our goal. We will help you operationalize a plan for delivering trauma informed care, support you as you address your board and leadership for buy-in, provide workforce training and increase community awareness. Take a peek at more feedback from current clients. 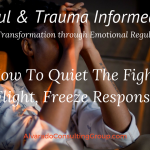 At Alvarado Consulting and Treatment Group we create unique trauma informed care training programs to fit your unique needs.